We are now transitioning to a study of gas giant planets, very different from the terrestrial planets in size, density, and composition. Jupiter's density is 1300 kg/m3. 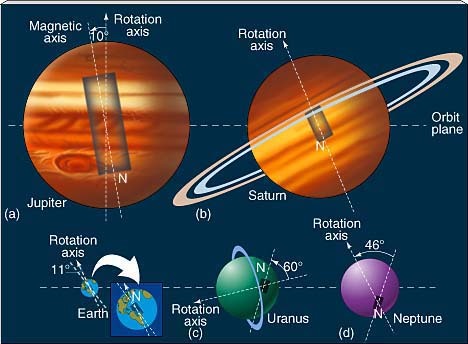 It is also exhibits differential rotation meaning that its apparent rotational period depends on latitude with the equator having a shorter rotational period than higher latitudes. What can we make of these facts? Differential rotation implies that Jupiter's visible surface is not solid but is fluid (e.g., either a liquid or a gas). Suppose that Jupiter is made of hydrogen which is compressed -- what would the density of Jupiter be if it were composed of hydrogen atoms squeezed as tightly together into a cubic crystal lattice as the size of hydrogen atoms in the ground state would allow? Or in other words, Jupiter can be modeled as being purely hydrogen. The actual situation is more complex with the outer layers being gaseous and the interior including a region of metallic hydrogen and a small core of heavier elements. Spectroscopy from the Earth and from the Galileo probe have confirmed that Jupiter is ~79% hydrogen, 20% helium and 1% of all other elements by mass (this is very similar to the composition of the Sun). The atmosphere merges with the underlying liquid hydrogen layers with no solid surface being present. The atmospheric features are the result of coloration by trace chemicals containing P and S and a complex pattern of circulation. Belts are darker appearing regions where material has cooled and is sinking while zones are comprised of warmer that is rising on a convective air flow. 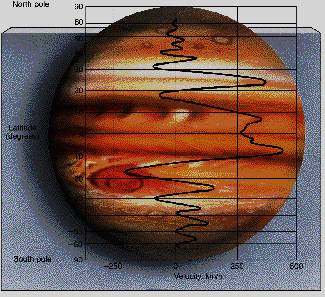 These regions get stretched all around Jupiter due to its rapid rotation rate. The velocities of gas in the belts and zones are similar to the jet stream velocities on Earth. Turbulence at the boundaries between belts and zones leads to the formation of large, whirlpool-like storms analogous to hurricanes on Earth. The Great Red Spot is an example of such a storm. Storms can persist for years on Jupiter because, unlike hurricanes on Earth, there are no continental land masses to disrupt the flow causing the storm. These moons show a density pattern analogous to that in the Solar System with the moon closest to Jupiter, Io, having the highest density being the smallest and the most distant having much lower densities and being the largest. Europa --next out, has a curious, cracked appearing surface which is only lightly cratered. From reflectance spectroscopy, the surface is mainly water ice which leads to an explanation of the surface fractures as resulting from process similar to that which produces ice floes on Earth. This explanation implies that a liquid ocean must lie underneath the icy crust. Tidal heating could keep water liquid in spite of the ~130ºK surface temperature. The lack of craters tells us that flooding must have occurred which filled in any recently formed craters. Ganymede -- largest of the Galilean moons (and the largest moon in the Solar System and is larger than Mercury), density suggests that its composition is mainly ices. Part of its surface is very heavily cratered and therefore probably very old. The surface also exhibits some "grooves" which may be the result of a process similar to plate tectonics. 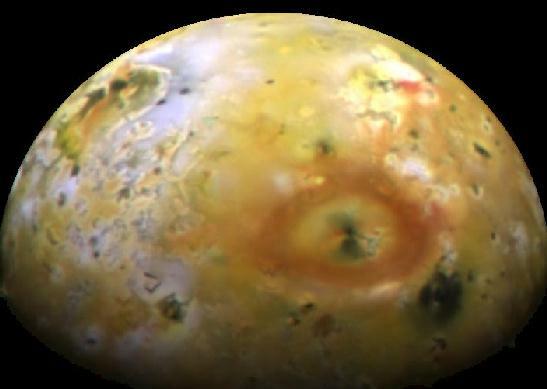 Callisto -- also has a density indicating an icy composition. Its surface is very heavily cratered and includes some fracture rings around the largest craters. There is little or no evidence of any re-surfacing or grooves. They emit more energy than they receive from the Sun! (note, you must be careful to distinguish between equilibrium temperature which can be changed by the greenhouse effect and the total amount of energy involved). We know it cannot be atomic fusion as in the Sun because these objects are too small to develop enough pressure in their cores to permit such reactions to occur. The rings surrounding Jupiter, Saturn, Uranus, and Neptune all lie within the Roche limits for these planets. We will asssume that the densities of the planets and moons are essentially the same. Titan -- is Saturn's largest moon and the only moon in the Solar System with an atmosphere. The atmosphere is mostly nitrogen (90%) and argon (~10%) with traces of methane and other hydrocarbons which cause an effect similar to smog rendering the atmosphere opaque. The Cassini mission will study Titan in more detail as its atmosphere may be a sample of what primordial atmospheres in the Solar System were like. Density is 1900 kg/m3, similar to Jupiter's two largest moons. Mimas, Enceladus, Tethys, Dione, Rhea, Iapteus -- all rotate synchronously with their periods of orbital revolution around Saturn. Densities are 1000-1400 kg/m3 so they are largely composed of ice. 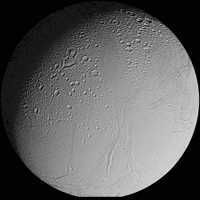 Some have heavily cratered surfaces while others show evidence of re-surfacing, presumably by flows of liquid water, especially Enceladus. What energy source has powered "volcanoes" on Enceladus remains a mystery as tidal heating appears to be too small. 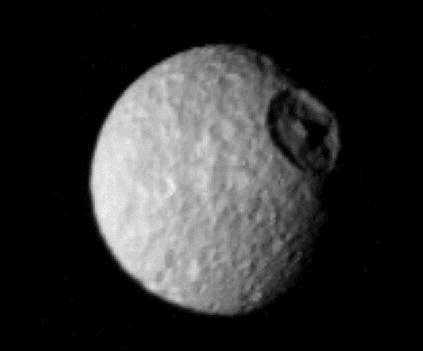 Mimas has an impact crater with a diameter of 1/3 that of the moon itself suggestive of a large impact which must have nearly destroyed Mimas. This lends credence to the suggestion that Saturn's rings were produced by a moon which suffered a catastrophic collision. Uranus was discovered by Herschel in 1781 by chance while he has surveying the distribution of stars. Uranus can be seen with the naked eye from a dark site. Neptune was discovered in 1846 by Galle who was searching for a planet in a particular part of the sky suggested by calculations of Adams and Leverrier. In retrospect, the discovery was actually by chance because the calculations had made assumptions that would not generally be true. Both of these planets are gas giants with diameters about 4x that of Earth. They are near twins in terms of size, rotation rates, and magnetic fields. -The density of Uranus is almost the same as that of Jupiter at 1300 kg/m3 while Neptune is denser is at 1600 kg/m3. -Both planets have rings although the the outer Neptunian rings are clumpy. 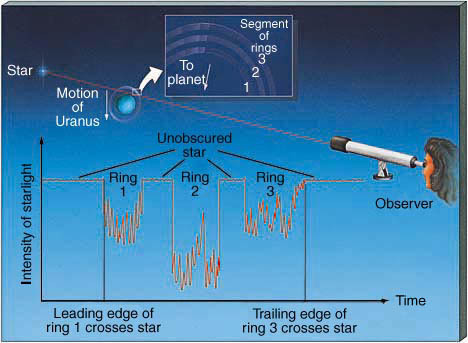 The Uranian rings were discovered in an occultation experiment where Uranus and its rings passed between us and a distant star. The rings around both planets are very narrow and orbital resonances with shepherd satellites are important in maintaining the shapes of the outermost rings. 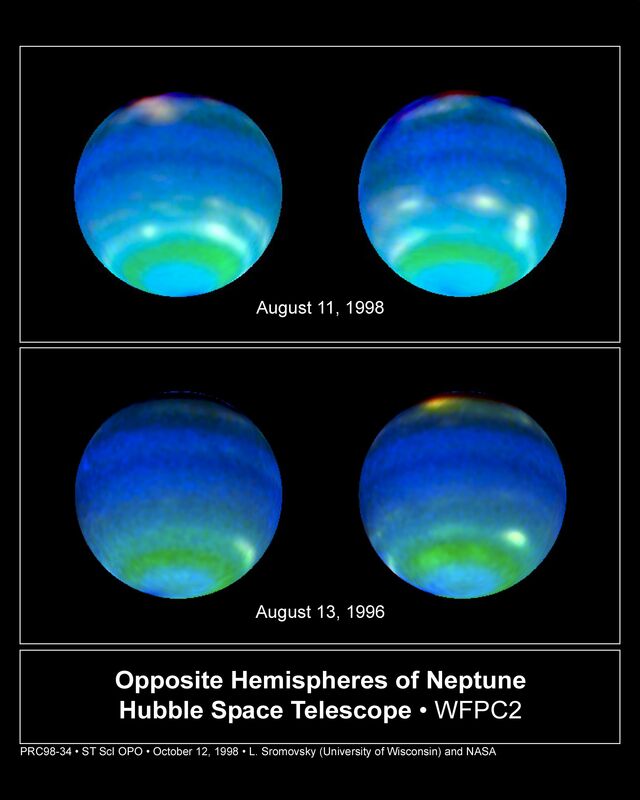 -Uranus appears virtually featureless at visible wavelengths while Neptune exhibits enough cloud contrast that its rotation rate was measured from Earth before the Voyager flyby. Composition -- mainly H2 and He with traces of methane, ammonia, and other gases. Note that ammonia which is responsible for clouds in the atmospheres of Saturn and Jupiter is much rarer in the atmospheres in Uranus and Neptune because these planets are cold enough that ammonia is frozen. The greenish-blue color of these two planets is the result of absorption of red wavelengths by methane. Weather -- Uranus appears nearly featureless, probably because of its lack of an internal energy source and its low temperature causes its clouds to be found at relatively low altitudes and hence veiled by thin, higher level clouds. Neptune has storms and band structures similar to those found in Jupiter's and Saturn's atmospheres. both planets have substantial tilts between their rotation and magnetic axes (Earth has an 11º difference in the directions of these two axes). The magnetic fields are also offset from the centers of the planets. How do these tilts and offsets square with the dynamo theory? Clearly the generation of magnetic fields in Uranus and Neptune must be different than in Jupiter and Saturn. Neither of these planets is large enough to compress H to a metallic state. Several possibilities exist of the conductive material -- possibly a partially frozen water ocean or perhaps ammonia is dissolved in a water ocean. Unlike all the other planets, the rotation axis of Uranus essentially lies in the plane of the Solar System. 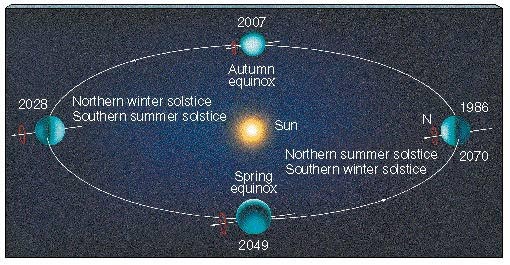 the Uranian north pole will point at the Sun for half its orbit around the Sun, e.g. for 42 years. this orientation affords a test of whether the pattern of solar illumination or rotation is more important in determining weather patterns. Atmospheric clouds and flow patterns follow the direction of rotation with velocities in the 200-500 km/hr range. The dark side of the planet is only a few degrees cooler than the sunlit side. 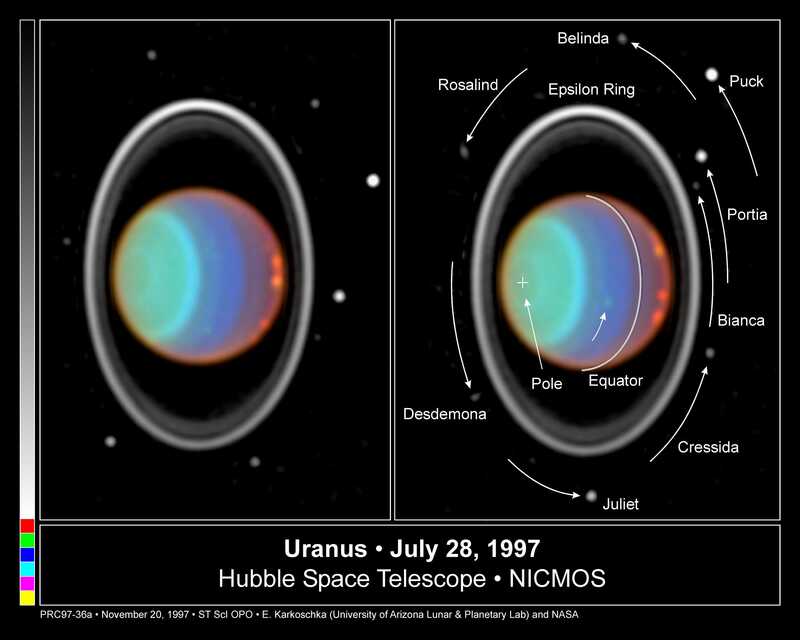 Uranus -- has a collection of moons comparable in scale to the system of moon's surrounding Saturn and Jupiter. The largest Uranian moons have densities in the range of 1100-1700 kg/m3 so they are icy moons. 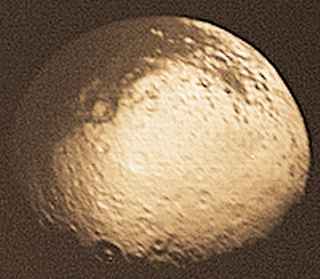 some moons are heavily cratered, all are darker (less reflective) than Saturn-' moons suggesting less resurfacing. The dark coloration likely is the result of solar UV radiation reacting with traces of hydrocarbons to form "tar-like" compounds. Neptune -- unlike the other gas giants, it has no moons with nearly circular, prograde orbits lying in Neptune's equatorial plane. The moons all have either retrograde, very eccentric or highly inclined orbits. N2 which may arise from nitrogen geysers that were observed by the Voyager flyby. The surface has some craters and also regions that appear to have been recently covered by ice. Note that because of Triton's retrograde orbit and tidal interactions with Neptune, it is moving closer to Neptune and will fall within the Roche limit in ~100 million years. Pluto: Smallet Planet or Biggest KBO? Pluto was discovered as the result of a search in 1930 by Clyde Tombaugh. Tombaugh's search was based on calculations by Lowell who thought he had detected discrepancies in the position of Neptune that implied the existence of a more distant planet. In fact, Pluto is too small to produce the alleged differences. Pluto -- is the smallest planet in the Solar System and is more similar in size and density to Triton than to any of the other planets. Its orbit is also the most eccentric and inclined of any of the planets - until a year ago,anf for the previous 20 years it was actually closer to the Sun than Neptune. Note that Pluto orbits the Sun three times for every two times that Neptune does so the two planets are not going to collide. Pluto might best be regarded at the largest member of the Kuiper Belt, a collection of small, icy bodies lying roughly in the equatorial plane of the Solar System which are remnants of the material from which the Solar System formed. Nearly 100 objects with diameters ranging from 100 to 400 km with semi-major axes of 30- 100 AU have been discovered since 1990.